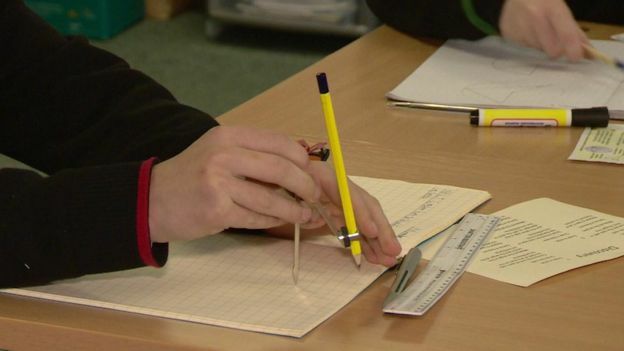 Stoke-on-Trent is trying to radically improve maths standards in its schools, including by helping to pay off maths teachers tuition fees who come to work in the city. The maths project is aimed at improving the chances for young people growing up in a city where many traditional industries have declined. Local MP Tristram Hunt is working with local schools, council and employers. Ofsted chief Sir Michael Wilshaw will launch the scheme on Wednesday. The £1m maths project, a form of educational urban regeneration, is aimed at attracting bright young maths graduates to a city struggling with industrial decline and academic underachievement. The city’s schools are among the lowest performing in GCSE results in England and have been criticised by Ofsted in a way Mr Hunt described as “pretty devastating”. In terms of the proportion of pupils in good or outstanding schools, Stoke is in the bottom 10 local authorities in the country. The Maths Excellence Partnership, co-ordinated by Mr Hunt, is an attempt to get local organisations, including Keele University and regional maths hubs, to join forces to support schools in improving maths. There is a target for 70% of pupils to achieve a good grade at GCSE maths in the next three years, up from 59% at present. Across the country, schools have reported difficulties in recruiting maths teachers. Mr Hunt, a former shadow education secretary, said it was “frankly difficult” for cities such as Stoke to compete for staff with cities such as London, Birmingham and Manchester. This will be in addition to the national bursaries already offered to attract students into training as maths teachers.